Sharing with you today the best spots for your Paris engagement photo session. Are you looking at getting your engagement photos taken in the beautiful Pareeeeeee? Good choice ! It's best choice, Paris is the most beautiful and romantic background to ever get your engagement photos taken - I'm a little biased, I'm Parisian ! But I admit that I have travelled a lot and nothing really compares to Paris. This is a classic spots but so full of different angles that you could spend your whole photo session there. You'll get the best view over the Eiffel Tower and the gardens of Trocadero. It's beautiful in every seasons, but my favorites are Spring and Summer as the trees and grass are full of colors. I recommend getting there pretty early in the mornings to avoid the crowd of tourists. This is one of the unique bridges of Paris : passing over the river la Seine, it has this unique architecture where the Metro line is passing on top of it and you can walk under the arches. Made famous by many movies, for instance Inception. Another classical but oh-so beautiful spot is the Seine river. Crossing the whole city of Paris, you'll have many choices as to which river banks you'll prefer to get. My favorite spots are down the Pont Neuf, down the Pont Bir-Hakeim, and Pont Alexandre III. Located just behind the Louvre, you can use it as a combo with the Louvre museum in your engagement photo session in Paris. This garden is huge and offers multiple background for your pictures. My favorite seasons to shoot there are Spring for its colorful flowers and Autumn for its golden falling leaves. Another option as combo with the Louvre is this garden located on the opposite site of the Jardin des Tuileries. It is usually less crowded and I love the arched architecture surrounding the garden. In the springtime you can catch the colorful flowered tress and some magnolia trees too. One of my favorites ! One the most extravagant and decorated bridges of Paris. The deck arch bridge offers a spectacular view and spans the Seine river and connects the famous Champs-Élysées avenue with the Invalides and Eiffel Tower. 9. Getting of the beaten tracks : Parc Saint-Cloud. This is one of the most undervalued parks in Paris. To be fair, it's not totally in the city, but the metro will get you there! (Line 10 Pont de Saint-Cloud or line 9 Pont de Sèvres). It is one of the most spacious, lush and beautiful parks you can get around the city. If you want that Versailles feeling without having to go amongst the crowds of Versailles, the Parc de Saint-Cloud is the best alternative spot for your French timeless and romantic engagement pictures in Paris. This week, I have been lucky to have Melani and Danny's Parisian elopement published on the French Wedding Style Blog. You can see the post here. 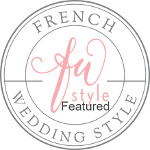 Cette semaine, j'ai eu l'honneur d'être publiée sur le blog de Monique : The French Wedding Style Blog. Retrouvez ici l'escapade romantique de Melani et Danny, venus tout droit de Djakarta pour se dire Oui dans la plus romantique des villes : Paris. Couldn't wait to share with you a sneak peek of this amazing beauty. Bertille got engaged this Saturday, isn't she stunning? Je ne pouvais pas attendre, il fallait que je partage avec vous un aperçu de ce week-end et de cette beauté à couper le souffle. Paris is indeed the most romantic city in the world. The perfect city for an elopement ! That's what Melani & Danny did and I've been honored to be part of their great romantic escapade. On ne le dira jamais assez, Paris est LA ville la plus romantique au monde. C'est donc ici que Melani et Danny ont choisi de se dire Oui en tête à tête, et j'ai eu l'honneur d'être le témoin photographique de cette belle escapade. Pour ceux, qui se souviennent, nous n'avions pas été très chanceux avec le temps et la Citroën traction, ça se passe ici pour ceux qui ont raté, mais ces petits aléas n'ont rendu l'expérience que plus belle. Location : Hotel Georges V.